Bro, don't like that la, bro...: Happy Father's Day 2013! Hey early comic today! And that is ALWAYS a good thing! It's okay to share nice heart warming stories on Facebook. It's not okay if you try to guilt us to share it. If you include that sort of thing at the end of the post, you have serious mental issues and I will believe that you work on the same retarded level as the jackasses who posts those "1 share = 1 prayer" crap. Yep. A blatant detour there at the end anyways. Still I hope the message is clear. I know it is not Father's Day yet. But here it is in advance because I might forget. So this weekend will be Father's Day and I would like to wish everyone a super Fathers' day to all the super fathers out there! Fathers also play a very strong role in bringing us up. That's why we also have to thank our dads to keep us in check or else all the bros would be dead by now. In fact, we believe that fathers are pretty super too. This Father's Day comic is done for DiGi in conjunction with the upcoming Father's day! THERE'S MORE! 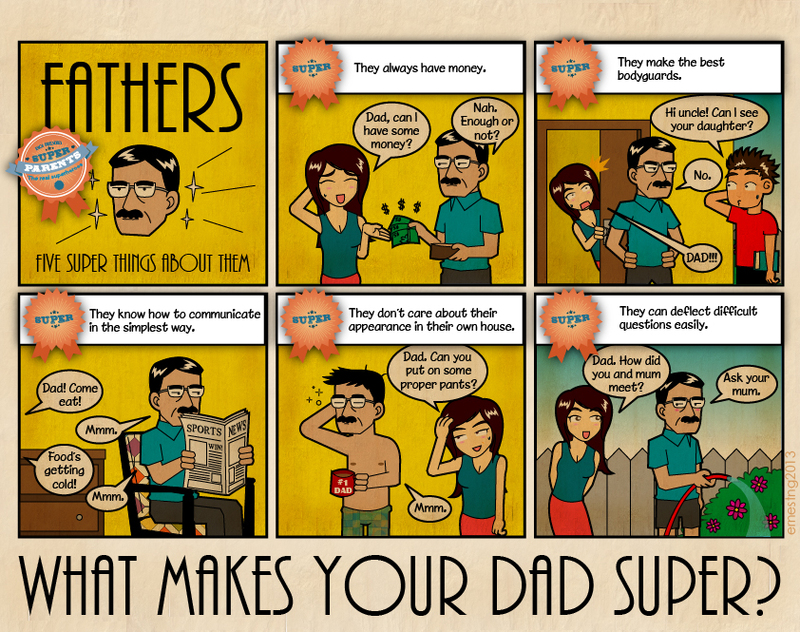 CLICK HERE TO SEE THE FOUR TYPES OF SUPER DADS! If you think your dad is super, you should get him a super gift! How about an iPad mini or and iPad with retina display to show your super love to your super dad? DiGi is now having a promotion from 8 May - 17 June 2013 where you can enjoy a RM100 discount on the devices, RM5/month rebate for 12 months and FREE Deezer subscriptions when you sign up for DiGi's Tablet 2GB Plan! Don't miss this chance to grab on this special deal! Maybe it's time to get your dad something super too! CLICK HERE TO GET TO THE PROMO! Have a super father's day! im not a father yet but thanks. Can they please put a like button... so that i can like this post... so awesome bro!! I have to agree with the statement on the 'sharing' bit. It's ridiculous. Why do you need to broadcast it if you love your father? It's not like most of our parents are on the net? I still think humanly 'real live' gestures are much better suited than internet proclamation. It's stupid. The super dad strip is so funny, I love it. yeah agree. dont understand why they have to spoil such a nice post with that 'share this if you love your dad' at the bottom. I like super power number 1.
everyone likes super power number 1.
yeah i think all dads talk like that. Haha, So true!! Love this comic! The communication one sounds so much like my dad. :) Happy Father's Day to all the dads!